Few things can be said about the impact and power of the mind that haven’t already been explored, to varying degrees of quality, in every self-help book or scientific study of the mind in the world. Yes, the brain is powerful. Self-help books recognize this in sometimes ethereal terms. Scientific books explore this with deep scientific evidence and study. Regardless, the consensus is the same. The brain health of every person is essential. For better or worse, the brain is always organizing and changing thoughts and feelings without much concern for how or what a person is doing. This listlessness can be channeled through biofeedback and getting a grip on the primate mind. Dr. Leigh Richardson of The Brain Performance Center has been helping people improve their brain health in Irving and Dallas. Wandering, listlessness, and self-referential nonsense plague everyone when they are actively doing something they do not want to be doing. In some circles, it is called the monkey mind. The connection is primitive, apparently, and it dials into a primitive nature to have the mind wander without coherent organization. Yale University has explored this area. The experts have found that intentional and focused meditation can alleviate the presence of the monkey mind. It allows people to focus on minimizing the default mode network. The default mode network, or DMN, is a mental process where if the brain is not thinking actively, it will think of something. It is why the monkey mind is so prolific during boredom. But, yoga and meditative techniques minimize a restless mind and minimizes placing mental energy in an unproductive place. The DMN is the default position when people are not thinking. So, the response is to think about more things by engaging the mind. Individuals explore hobbies, direct their mind to a productive place, listen to music, etc. Mind wandering is a minor nuisance, but is it really a distressing problem? The answer is yes and no. In some cases, mind wandering can be a healthy way to not have to always be “on” and engaged. It allows the mind to rest. This mind wandering mechanism is suggested for dreaming, allowing the mind to organize thoughts which often manifest in comprehensible messes known as dreams. This is only one argument, and others have explored the exact opposite- the full meaning of dreams. Regardless, mind wandering is not necessarily unhealthy, but it is tied to unhappiness. Implementing proper brain heatlh means coming to terms with wandering. This includes when it is healthy and when it is not. The study of biofeedback is tangential to the monkey mind. Brain health, on a day to day basis, is usually based on responding and feeling oneself and focusing this energy. Basically, biofeedback is the understanding that the body will have physical and biological symptoms that result from mental health. Feeling depressed? The body is going to react by shutting down early (fatigue) eating food (cravings) and other factors. The body physiologically responds to how the brain is “feeling.” it is all connected and it all starts with the mind. The feedback also sets a baseline and determines how people respond. What happens when they feel stress? What happens when that stress manifests as fatigue or cravings? These are what brain specialists in the area are interested in. Yoga and mental exercises help channel mental health. By consequence, the biology of the human body will respond. There are not a lot of unhappy people who are in good health. It doesn’t work that way, in general terms. But, there are many people out there who are healthier because they are happy. They have learned to focus listlessness. They have learned to channel their energy in a happy direction. Their biofeedback has responded. The popular vehicle manufacturer Toyota has recently begun to build a new headquarters for the company. This new campus incorporates all current branches and employees into one central location, and it provides the opportunity for a more stream-lined and efficient business model. At this new, state-of-the-art facility, an emphasis will be placed on conservation and unity within members of the Toyota family. Why Choose Plano For the New Headquarters? Plano was chosen as the location for the new Toyota campus for several reasons. First, Texas has tax laws that are beneficial to businesses, so moving here made financial sense. In addition, there aren’t any other Toyota operations in the area, so it provides a fresh start for the company as it moves forward and consolidates operations into one headquarters. These factors coupled with a low cost of living and family-friendly culture made Plano the perfect choice for Toyota. How Will Current Toyota Employees Be Affected By This Move? Toyota’s New Headquarters in Dallas is expected to house between four and five thousand workers in total. All of the current Toyota employees in the three locations affected by this move are invited and encouraged to transfer to the new campus. As of now, approximately three quarters of current employees have indicated that they are willing and able to relocate along with the company. To help current workers make the decision to transfer to Plano, Toyota has been offering to pay for employees and their families to visit the area to see if living there will be a good fit. The company has made it clear that they do not wish to reduce their workforce with this move, and it is not an effort to cut down on employee numbers. For those who decide to move, relocation packages and retention incentives are being offered. Some employees are already working from temporary offices near the new campus, and they are also involved with testing and selecting new furniture and office equipment for the company. What Will the New Headquarters Look Like? Located on a 100-acre piece of land near Plano, Texas, Toyota’s new headquarters will strike a balance between modernity and native Texan. There is a focus on efficiency and conservation on this campus, and Toyota will be trying to obtain the most prestigious ranking possible for ecofriendly, green buildings. An emphasis is being placed on alternate energy sources and conservation to help offset the impact this campus will have on the local environment. Solar panels will be located on most buildings and garages, and rainwater will be collected for use on landscaping and other vegetation on the property. The main buildings will be made of glass to allow for plenty of natural light and a pristine, modern feel. However, they are also constructed to provide plenty of shade and prevent the buildings from becoming too hot or bright in the Texan sun. When Will Work Be Completed for the New Campus? As of now, Toyota expects the new Plano campus to be completed by the end of 2017, with some spaces completed earlier in the year. While some temporary offices are already in place and occupied, the first workers should be moving into their new permanent work spaces mid-2017. The entire transition should be completed before 2018, however. 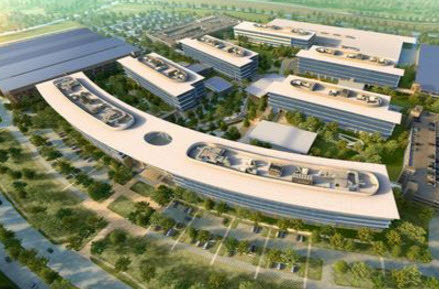 The new Toyota headquarters in Plano, Texas, promise to create a new opportunity for the company to redefine and improve itself. By having all of its operations in one location, more efficiency is expected. In addition, the new campus will allow for employees to become more unified and enjoy environmentally-friendly work spaces near Dallas companies. This move will create new changes and direction for the brand as it moves forward. See full PDF Press Release from Toyota about why this is “good for Texas”.